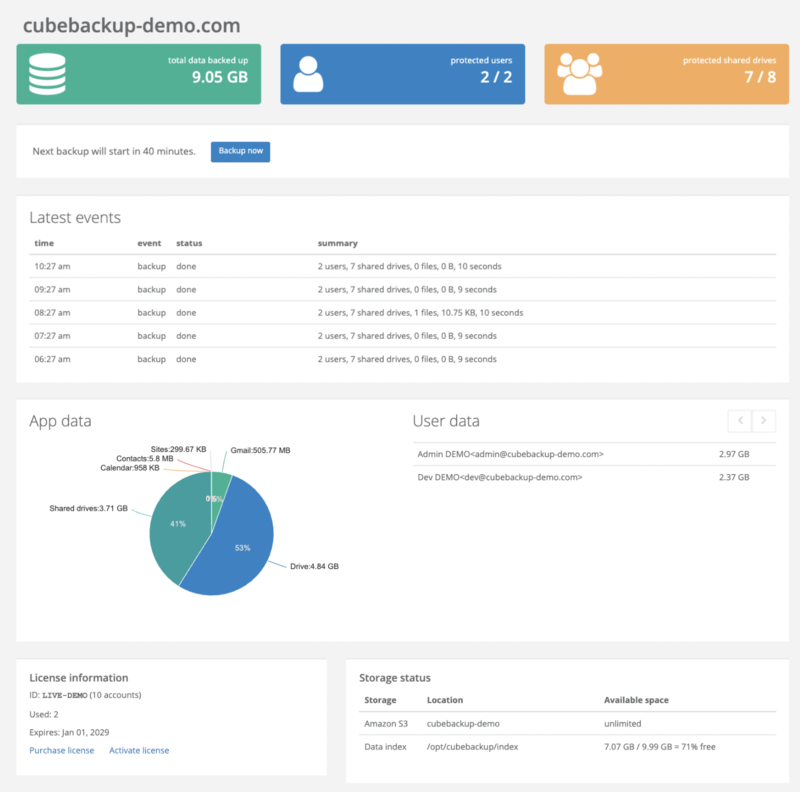 Central to the CubeBackup web console is the overview page, which provides administrators with all essential information at a glance for the active domain. Here you can find the total data in the backup, number of protected users and Team Drives, latest events, a graphical breakdown of app and user data, as well as license information and storage space status. For the protection and security of your data, CubeBackup will NEVER overwrite current working versions. All restored data, whether Google Drive files or folders, Gmail messages, contacts, calendar events, or Sites files, will be placed in a specially created folder named Restored <date-time>, and will NOT overwrite the current working data. This means you can safely restore any data to any version at any time without worry. 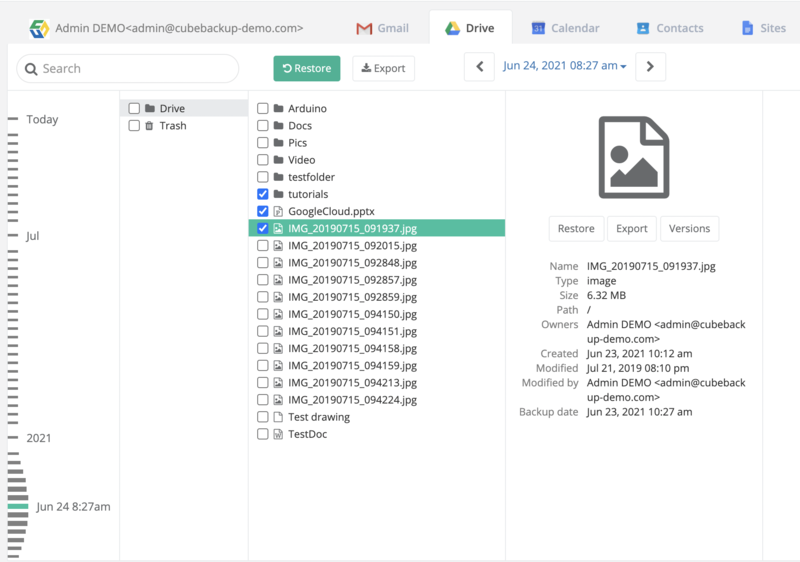 CubeBackup is designed to keep a version history of all of your data, including entire folder structures, making it easy to restore to an earlier point in time. For example, you can turn back the clock on an entire project, restoring all files and folders to the exact state they were in two months ago. Select Users from the left panel. Select the user whose data needs to be restored, using the search box if necessary. Click the Drive tab on the user restore page. Find the file by browsing through the Drive structure, or use the search box. Click on the file to display detailed information, including filename, size, and backup date. Click the Versions button to list all available revisions of the file. Select the version to restore and click Restore under the Actions column. Select the account you’d like to restore the file to and click Restore. The timeline in the left panel shows the available snapshots, each representing the state of your entire Google Drive at that moment in time. Use the timeline to select the point in the version history you would like to return to. Select the files and folders you would like to restore, using the search box if necessary. Select the account you’d like to restore the files and folders to and click Restore. A new directory is created in that user’s Google Drive, containing the restored files and folders. The folder will be named Restored <date-time>. These files and folders can then be manually moved. Select the Team Drives from the left panel. Select the Team Drive whose data needs to be restored, using the search box if necessary. Find the file by browsing through the Team Drive structure, or use the search box. Select the Team Drive you’d like to restore the file to and click Restore. The timeline in the left panel shows the available snapshots, each representing the state of your entire Team Drive at that moment in time. Use the timeline to select the point in the version history you would like to return to. Select the Team Drive you’d like to restore the files and folders to and click Restore. A new directory is created in that Team Drive, containing the restored files and folders. The folder will be named Restored <date-time>. These files and folders can then be manually moved. Click the Gmail tab on the user restore page. Select the messages you want to restore. You can filter messages using the search box or the date controls at the top of the page, or also by Gmail labels. Select the account you’d like to restore the messages to and click Restore. Select the checkbox beside All in the mail labels section. You may also want to check Spam and Trash folders if you would like to transfer junk or deleted messages. These are not included under All. The messages are restored to the user’s Gmail account, and labeled Restored <date-time>. All original labels and timestamps are preserved, so if a message was originally labelled Inbox, TeamWork, and Important in Gmail, when restored, it will appear under the Inbox, TeamWork, Important and Restored <date-time> labels. Click the Contacts tab on the user restore page. The timeline in the left panel shows the available snapshots, each representing the state of your entire Google Contacts at that moment in time. Use the timeline to select the point in the version history you would like to return to. Select the contacts or groups you would like to restore, using the search box if necessary. Select the account you’d like to restore the contacts to and click Restore. A new group is created in that user’s Google Contacts, containing the restored contacts. The group will be named (Restored <date><group_name>). These contacts can then be manually moved. Click the Calendar tab on the user restore page. The timeline in the left panel shows the available snapshots, each representing the state of all Google Calendars belonging to that user (and all Calendars shared with that user) at that moment in time. Use the timeline to select the point in the version history you would like to return to. Select the events or calendars you would like to restore, using the search box to find events, if necessary. Select the account you’d like to restore the events or calendars to and click Restore. In the user’s Google Calendar, a new calendar is created for that user, containing the restored events. The calendar will be named <user> (Restored <date-time>). NOTE: CubeBackup only backs up your own calendars. System calendar (e.g., Birthdays, Holidays) and calendars shared from others are not included in the backups. NOTE: Due to limitations of the Google Sites API, CubeBackup cannot backup the New Google Sites - it can only backup Classic Google Sites. More information is available at https://developers.google.com/sites/. Click the Sites tab on the user restore page. The timeline in the left panel shows the available snapshots, each representing the state of all files in each Google Site belonging to that user at that moment. Use the timeline to select the point in the version history you would like to return to. Select both the account and the site you’d like to restore the files and folders to, then click Restore. The restored pages and folders can be found at Restored <data-time> folder in Sitemap on the site. If the Sitemap is hidden on your site, please access the url https://sites.google.com/a//<sitename>/system/app/pages/sitemap/hierarchy to open the Sitemap page. 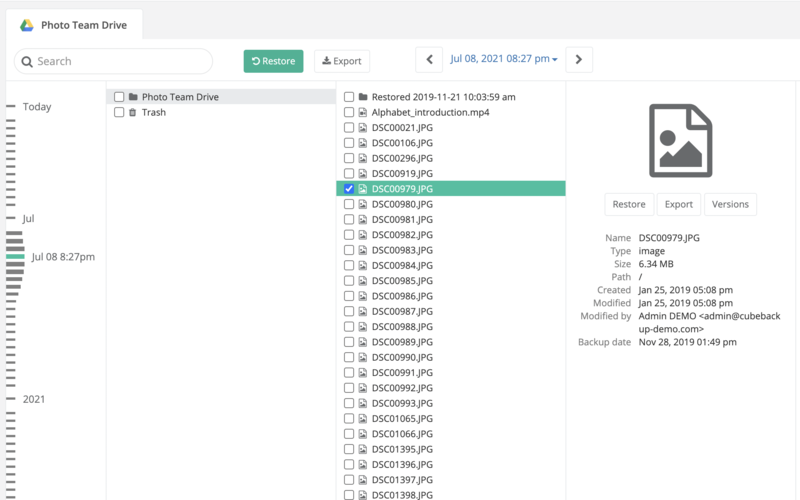 The history page displays the Backup and Restore logs so you can easily monitor recent activities. Each time a backup cycle has completed, a log entry will be added to the history page. Detailed information is given, including start time, duration, amount of data, and any error messages. The Show only errors box can be selected to filter the backup history to only show warnings and error messages. Clicking on Warning or Error in the status column will bring up a pop-up box with specific details about the problem. These detailed messages can be copied and sent support@cubebackup.com, if you need assistance. Similarly, restore operations are also logged and displayed in the restore history page. You can filter the restore log by selecting All, Gmail, Drive, Team Drive, Calendar, Contacts or Sites from the dropdown list in the upper-left. Checking the Show only errors box will filter the list to only display warnings and error messages, and clicking on Warning or Error in the status column will bring up a pop-up box with specific details about the problem. These detailed messages can be copied and sent to support@cubebackup.com if you need assistance.